On Saturday, we reported that 63 year-old Tucson mass shooting victim Eric Fuller had been arrested for allegedly making a threatening comment to Tucson Tea Party co-chair Trent Humphries at the taping of a Town Hall event for ABC News’ This Week with Christiane Amanpour. Remarkably, the program aired Sunday morning, and the alleged threat “You’re dead” can clearly be heard as Mr. Humphries speaks. TRENT HUMPHRIES: It’s not just gun laws that are standing in the way of this happening. There are all kinds of laws that Congress needs to look at and — and I think there is a time for this debate. But for what we saw and felt right now, I’m not sure that applause and things going on are appropriate right now until we’ve had actually, maybe had the funerals finished for the people that have –that were (sic) suffered and died. My neighbor is one of those people. And — and I loved that man. And — and I want to see — I want to see some introspection maybe from the people before the national debate happens. You know, and those — and — and it’s very well to have those things. But something’s going to have to happen with — with everybody. And — and I just — I mean, it’s — it’s something that where as a country, we talk about political discourse and what’s appropriate and what’s not. I think that — that applies to everybody including the media who’s — who’s — you know, and not in this — this — this has been a very, very cathartic thing for everybody. Immediately after the shooting to see people jump to political angles. I just don’t want to see that right now and I’m a very political person. So I — I would ask that maybe we — we have that discussion and it’s a larger discussion and that — and that we have that just a little bit later. Humphries doesn’t appear to have heard the initial remark, but there’s a moment, later in the clip, There’s a spot later in the clip, where he turns his head at another less audible utterance from someone in the crowd. 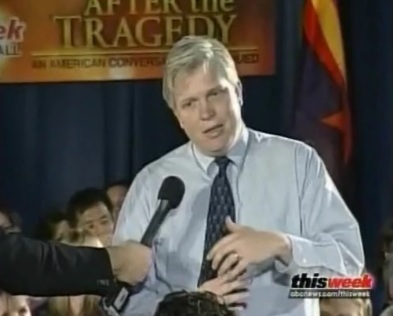 Update: Upon repeated viewing, and isolating the moment in question, it appears that the dark-haired man seated directly in front of Humphries hears the “You’re dead” comment, and in the next shot, is looking right at the camera. Then, at the :39 mark, you can hear “That was just wrong” in a quiet enough tone that it’s unlikely it was anyone else. Fuller has since been involuntarily detained at an undisclosed mental health facility, according to NBC News. Update from Tommy Christopher – Some have pointed out that This Week did a poor job in handling this incident, a valid criticism. This piece was not intended as a critique of the show, but rather, as a report on the footage that was aired. However, it is a fair observation that the producers could have pointed out the alleged threat in real-time, and transposed their afterword to this part of the show, without being exploitative, or derailing the overall theme of the show. In any case, if the concern was with disrupting the program, or whatever the concern was, the newsworthiness of this incident should have rendered those considerations tertiary.